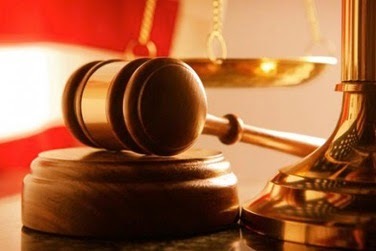 On January 10, 2014 Atlantic County Superior Court Judge Nelson C. Johnson ordered depositions of any witness including Township employee Eric McCarthy to be taken on or before April 10, 2014. McCarthy is the Township's IT / Network Technician. The order was issued in relation to a lawsuit filed by Walter M. Luers Esq., on behalf of John Paff. The lawsuit filed in Atlantic County Superior Court on August 19, 2013, alleged the Township refused to provide Paff with "copies of emails logs that they are capable of producing and have produced in the past." According to the complaint, on June 28, 2013 Paff submitted an Open Public Records Request seeking an email log "that shows e-mails sent by the Township Clerk between June 3, 2013 and June 17, 2013" and "that shows e-mails sent by the Township Police Chief between June 3, 2013 and June 17, 2013." Paff also submitted a copy of an e-mail log previously released by the Township in a previous OPRA Request, showing the documents clearly exist. On July 8, 2013, Kay denied access to the requested records, stating that "IT is unable to provide logs on email communication." The complaint alleges, "on prior occasions and in response to prior OPRA Requests, Defendants have provided similar e-mail logs and, on information and belief, Defendants continue to be able to provide such logs." See original 2013 story here. According to Judge Nelson's order issued on January 10 2014, each party shall exchange such requests for discovery and identify additional individuals who may need to be deposed by April 10, 2014. In addition to the depositions and discovery Judge Nelson also ordered, "in the event Mr. Luers elects to obtain an expert and should it be necessary for that expert to visit the Township offices, Mr. Fitzgerald and the Township shall cooperate with him in facilitating and expediting such inspection of the Township's computer system as may be necessary to provide Mr. Luers and his client with the sufficient information as to how the Township's system(s) operate." According to John Paff, Township Solicitor Michael Fitzgerald already questioned Paff under oath during the January 2014 court hearing and further inquired who notified Paff that the Township was not releasing the email logs. Fitzgerald further questioned if it was a former clerk of Galloway Township, more specifically Lisa Tilton. Paff acknowledged Tilton did in fact contact Paff regarding the Township's denial of email logs. Fitzgerald further questioned if there was relevance to the dates chosen on the OPRA request for the emails Paff requested for the email log. Tilton is the Publisher of this website and the former Custodian of Records and Township Clerk of Galloway Township. We expect to be subpoenaed as a 'fact witness' for the plaintiff John Paff as we had comprehensive knowledge of the Township's network system and capability of producing email logs during our tenure of employment with the Township of Galloway. 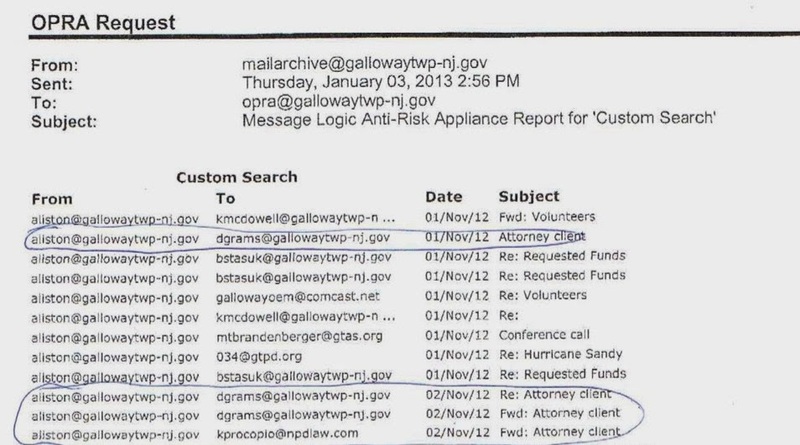 Galloway Township News previously received email logs from the Township in January 2013 until a dispute occurred regarding a 'special service' that the Township attempted to issue to this Publication. We disputed the special charge and the Township provided the emails requested at no cost. After that dispute, the Township no longer released email logs stating they did not exist. The court shall conduct a Plenary Hearing on Thursday, May 8, 2014 at 10:30 a.m.
LOL only in Galloway. Attorney: "Uh who told on us?" Response: "Someone who knows more than you!" This is a three ring circus in Galloway. The outcome of this lawsuit will indeed have a rippling effect on every town in the State. This is what transparency government is suppose to be, but it seems as if Galloway Township doesn't want to be as transparent. I don't see any misrepresentations in this. People need to get a life to think otherwise. I think documents here speak for themselves.